Each day Umm Sameh walks for 15 minutes to fetch a single pot of water to meet her family's bathing, cooking, cleaning and drinking needs, amid recurrent nationwide water outages. "I suffer from back pain after carrying this pot on my head, but there's no other way to serve my family," says the 68-year-old grandmother, a resident of Saft El-Laban, a rundown area in Giza that has suffered over a month of water shortages. In most homes in Saft El-Laban, it is the women who are solely responsibility for housework. These days, with running water to their homes cut, they have to trek for a quarter of an hour or more to find a tap or well. In Egypt, vast disparities of wealth and resources are a common sight. Inequality manifests itself in education, lifestyle and use of government services. When it comes to the distribution of water, the differences between communities are stark. Saft El-Laban, along with other Egyptian slums and neglected towns on the northern coast, suffers from water shortages. But just a few kilometres from these spots are middleclass housing developments with lush gardens and seemingly abundant water. "Why is 6 October City rich with water while here the supply is cut?" asks Ahmed Selim, another resident of Saft El-Laban. Ahmed was one of the town’s residents who besieged the Giza Governorate headquarters to protest against the municipality's decision to cut water to his neighbourhood. In July, Saft El-Laban's popular committee – a league of citizens formed during 18-day uprising against Hosni Mubarak – occupied the government building and insisted they would stay until their water problem was solved. Young residents from the Montaza district of Alexandria also staged protests on 29 July, to express their anger after water and electricity in their neighbourhood was temporarily cut. The group demanded remedies to what it called "the injustice in water distribution." The governorate of Marsa Matrouh, on Egypt's northwest coast, is one of the latest places to experience shortages, but now it seems barely a day goes by without further problems. There are almost daily news reports of protests held by angry citizens blocking roads against water or electricity cuts. These civilians are usually poor and inhabit slums. "We are suffering from environmental bias. Policies and practices are biased in favour of the well-off over the marginalised," Hassan Abu Bakr, a professor of agriculture at Cairo University and an environmental activist, told Ahram Online. Environmental bias is shown towards cities over villages, coastal areas over southern ones, and rich ones over the poor, Abu Bakr stresses. In a recent study by the Central Agency for Public Mobilisation and Statistics, there are 1221 slums in Egypt, and 76 in Cairo alone. The number of squatters living in slums is 14 to 15 million, according to the agency. 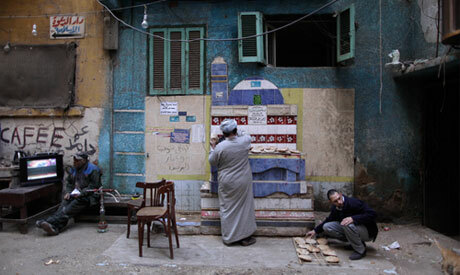 Many of them live in graveyards in Ain Shams, Nasr City, Megawerin, Bab El-Wazir and El-Ghafir. Slums are not equipped for human use, their residents are at the risk of storms, fires and stones cracking. Many of Saft El-Laban residents believe the water was cut by counter revolutionaries to show that President Mohamed Morsi is unable to bring services to the people. "Many of us here supported Morsi intensely because he is a good person and is a follower of God's word," Selim told Ahram Online. Conspiracy or not, the fact remains that the water shortage is not solely the result of official biases towards the rich. It results from a lack of awareness and unwise resource allocations. This lack of awareness is present both on the individual and governmental level. "Once an official told me that 50 per cent of domestic water is wasted because of inefficiency in the water system," Abu Bakr said. Also, having water at very low prices or even free of charge, leads some people to use it recklessly. "In many public places, one will find corrupted water taps, in addition to many open ones. Egyptians use water without much awareness or care about the allocation of water," Maghawri Diab, former head of Menoufia University and an expert on water issues, told Ahram Online. "Unfortunately, Egypt has reached zero line for water. Whereas the universal zero water line is 1000 cubic meters, for Egypt it has reached 780 cubic meters. Water production has currently dropped from covering 100 percent of the population in 2009 to covering 98 percent." Saft El-Laban has a long standing issue with water supply. However, it is only recently that residents have complained that no water at all reaches their homes. Before that, they used to get water for a couple of hours daily. The problem is still pressing despite promises by government authorities and water companies to solve the problem. The amount of water available is not sufficient to cover the whole population. Egypt is currently entitled to 55 billion cubic metres (bcm) of the Nile's total annual flow of around 84 bmc under a treaty with the eight other countries that share the river basin. The Nile River contributes 97 percent of Egypt's water supply. The remaining 3 per cent is ground water (10 bcm annually), recycled water (7 bcm) and rain water (0.5 bcm). Domestic users consume 9 bcm annually, of which 30 per cent is wasted in water networks. "Water systems in Egypt are in a bad condition and we also lack strategic planning," Diab told Ahram Online. Egypt will need nearly 50 per cent more of the Nile’s water by 2050 to cater for a population of around 150 million, according to experts at Egypt's National Planning Institute. This does not require a new agreement with the Nile Basin countries as much as it needs better water allocation by Egyptians, claims Diab. President Morsi recently appointed former minister of water resources and irrigation, Hisham Qandil, as prime minister. The decision could be explained as a way to tackle these pressing water shortages. Egypt's water problem requires collaborative work by different segments of the society. Until then, many people will suffer. "Water is a basic right for animals, what about humans?" said Selim in Saft El-Laban. The head of domestic water and sewage in Giza, Amr Wahsh, told the press that they are doing their best to solve the water problem in Saft El-Laban, but it has been around month now and the citizens say nothing has changed. Dude Ethiopia is totally gonna win the playoffs! GO ETHIOPIA!! EGYPT SUCKZ! Water is basic right for animals what about humans? What about all the billions of US aid to Mubarak? Ask Cameron to give back Mubaraks family assets in UK Banks and give humans some wather.. and by the way ask for the Rosetta Stone to be given back.